The title ‘Amintiki Epitheorisi’ means Defence Review. The English subtitle Hellenic Defence Review is shown on the front cover. The magazine covers the all service branches of Army, Air Force and Navy, and also Special Forces each month in the fullest and most reliable way. Exercises, visits to units, weapons systems ( tanks, aircraft, surface ships, submarines, portable armor etc.) 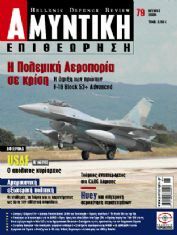 , analyses and technological developments are only part of the agenda of the leading defense magazine in Greece, filled with interesting columns, revealing news, exclusive interviews, quizzes etc. In 2007 the magazine underwent a redesign to distinguish itself from a slew of rival magazines that had recently appeared. It now features more news and short features and full colour on every page. Issue 79 was dated June 2009.